Ideally, an assessment of national INDCs would start with a specified level of global ambition (e.g. a 2°C compliant global emissions pathway) and a coherent and well-specified notion of national fair shares, one based on a transparent interpretation of the core equity principles of the UNFCCC. There are two difficulties with this. First, there is no single, universally accepted framework for national fair shares. One way to account for this (using “Equity Bands” that accommodate a diverse range of equity perspectives) is described in the document High Equity, Low Equity, and the Equity Band. Second, pledges have almost universally been so modest that any evaluation relative to the scientific requirements (e.g., a good probability of holding warming below 2°C) does not provide a useful basis for comparing pledges to each other, making it difficult to clearly identify leaders and laggards. In this context, it can be helpful to supplement the notion of “fair share” with the notion of “comparable effort.” That is to say, a national INDC can be evaluated not only by comparing it to a national fair share of the scientific requirement, but also by comparing it to other national INDCs, which, of course, may be neither ambitions nor equitable. The table below, and the Comparable Effort Worksheet, show how these questions can be answered. (See also the National Fair Shares report for details.) First, “What effort (for any other country) would be comparable to the EU’s at “least 40% below 1990” pledge?” To answer that question, we can calculate what fraction of EU’s fair share of a global 2°C effort its INDC comprises, and then for any other country how much mitigation it would need to pledge in order to contribute the same fraction of its own fair share. 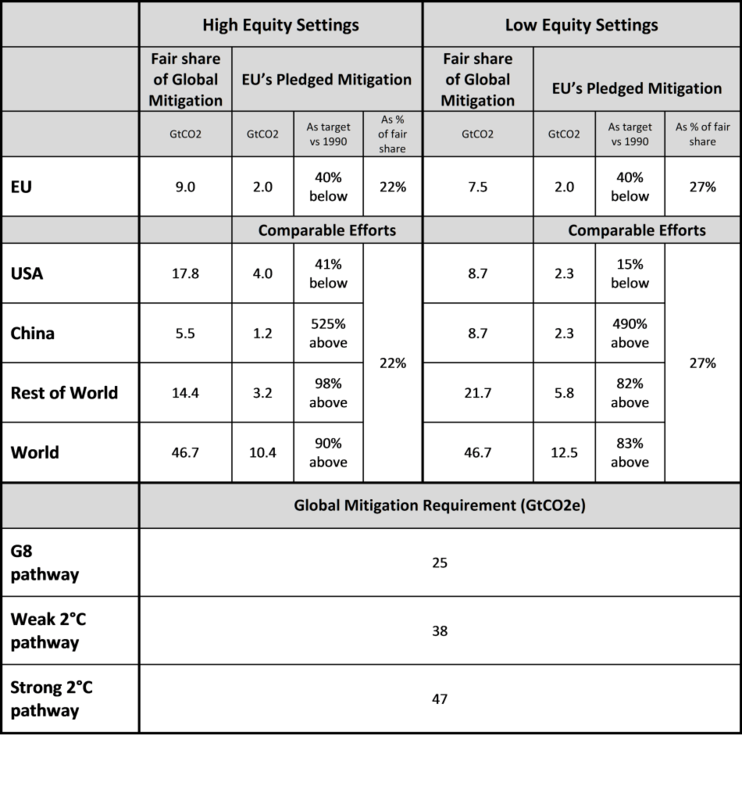 We estimate that the EU’s INDC amounts to roughly 2.0 GtCO2e of mitigation effort below the EU’s projected 2030 baseline. This is approximately 22% of the EU’s fair share of a global 2°C mitigation effort (9.0 GtCO2e) in 2030 as calculated using the Climate Equity Reference Calculator set to the High Equity settings, or 27% of its fair share (7.5 GtCO2e) calculated using the the Low Equity settings. Assessing the level of effort for the USA and China (and Rest of World) that would be a comparable effort to the EU’s INDC, by positing that each does the same percentage of its fair share of the global mitigation as the EU. The US would have to reduce its emissions 41% below 1990 levels to offer an effort that is comparable to that implied in the EU’s INDC, calculated using the High Equity settings, while China would have to limit its emissions growth to 525% above its 1990 level. Using Low Equity settings, these figures are 15% and 490%, respectively. The resulting total mitigation globally is 10.4 GtCO2 and 12.5 GtCO2 using the High and Low Equity settings, respectively. The table above also presents the answer for the second question, telling us to what overall global level of effort would the EU’s INDC make up a fair share contribution. Adding the EU’s INDC to comparable efforts from the US, China, and Rest of World, we see a global total level of mitigation in 2030 of 10.4 GtCO2e using High equity settings, or 12.5 GtCO2e using Low Equity settings. Global “Ambition Band,” based on EU INDC. 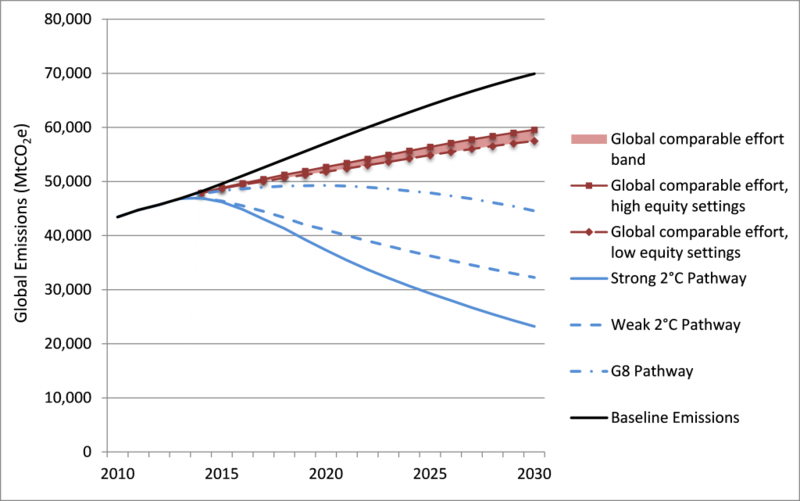 The red band represents the range of global emissions that would be achieved if the EU INDC were to be matched by comparable efforts by all other countries. The top of the band shows the consequence of all countries doing 22% of their fair share of the global mitigation required for Strong 2°C pathway (matching the EU’s effort, assuming High Equity settings) and the bottom of the band shows the consequence of all countries doing 27% (matching the EU’s effort, assuming Low Equity settings). The three blue lines show the G8, Weak 2°C, and Strong 2°C pathways, for comparison. First, the EU’s fair share of the global effort as calculated by some other approach to equitable effort-sharing would somehow have to be found to be much smaller than that found using the Equity settings considered here. However, since the Low Equity settings assume that capacity is defined with zero progressivity (no development threshold that excludes the income of even the very poor from the calculation of a country’s capacity) this would effectively require a “fair shares” arrangement that is actually regressive, in essence requiring poor countries to contribute more per dollar of income to the global effort than do the richer countries. Or, second, and far more plausibly, the EU’s pledged domestic mitigation could be accompanied by a second commitment, one to provide a significant level of international mitigation support. Given the small size of the EU’s pledged domestic reductions, its pledged international support would need to be quite large – roughly two times larger in terms of tons of mitigation supported assuming Low Equity to reach the Weak 2°C pathway, and as much as four times larger assuming High Equity to reach the Strong 2°C pathway. Most of this increase, of course, is attributable to China’s economic growth since 1990. See the Calculator for details. Note: We use here the Strong 2°C pathway to show the calculation of comparable efforts, but the results are actually independent of the choice pathway. A different pathway such as the G8 pathway would lead to a smaller fair share for the EU (and all other countries), and imply that the EU pledge makes up a larger percentage of its fair share, and the end results would all be the same.